This is the modified text of a lecture I recently gave at London Royal College of Music. What’s found in the estate of what we have come to refer to as an ‘exile musician’? The obvious answer is of course, music. 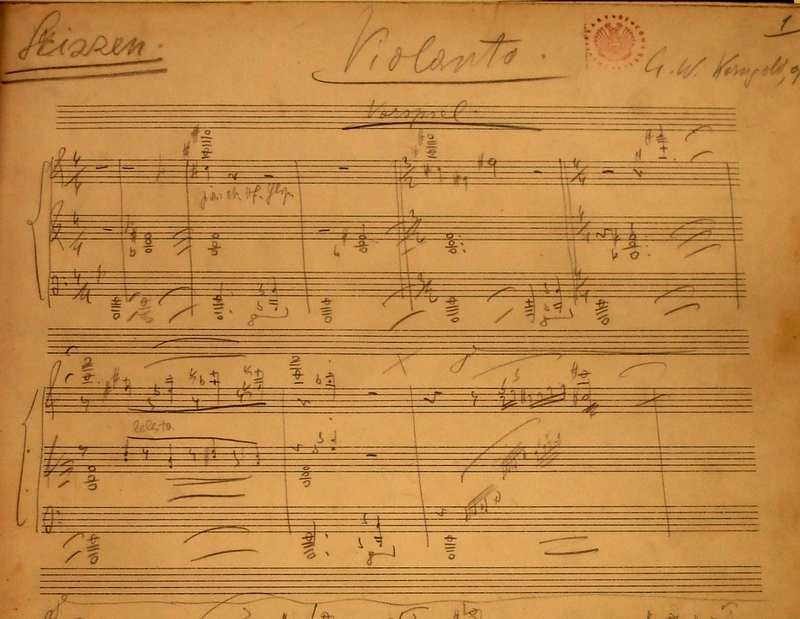 If we’re looking at the estate of a composer, we find manuscripts, sketches, first drafts, publisher’s proofs, corrected proofs and can – under certain circumstances follow the evolution of a work from jotted-down idea in the middle of the night to full published score. There’s a thrill discovering a familiar theme in a composers sketch book that is identified later in a violin concerto or opera. When I took on the role of music curator at Vienna’s Jewish Museum, finding such gems was a highlight of rummaging around estates in search of display objects for an Exhibition. Nothing tells a story like an object, and an object can be anything from a letter to an ink pot. 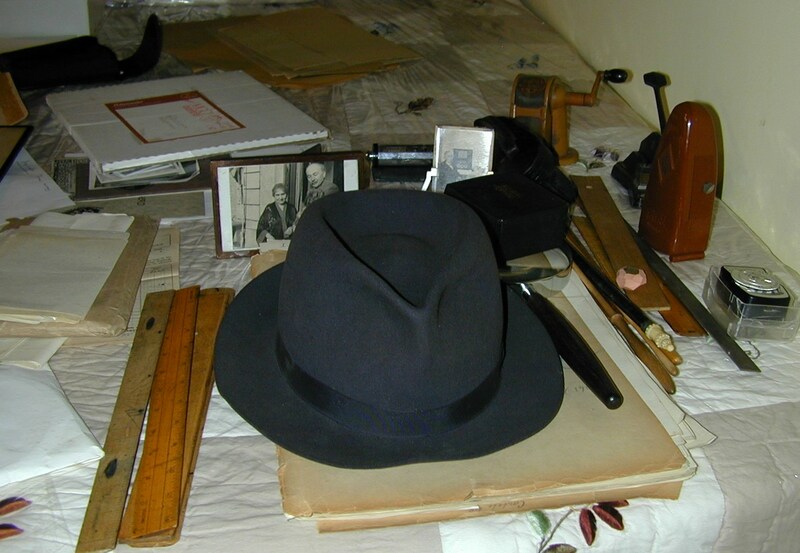 If a artist expresses themselves by writing music, letters or essays, there also are the very objects surrounding the artist as a person – objects we call ‘ephemera’, that remind us that the artist was also one of us: But most important of all, an estate in its entirety places the music, essays and correspondence into a historic context. When dealing with music and the Third Reich, it’s impossible to separate music out of context – and even works that seem a-political take on a significance once viewed through the objects that have accompanied, facilitated or documented the life of the musical émigré. 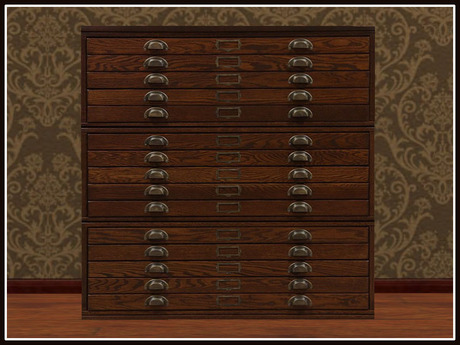 Before beginning this process, we have to establish one essential fact: a music estate is far more than what in German is referred to as ‘Flachware’ or ‘Flat Ware’ – this is not an American expression for cutlery, but a reference to paper, letters, documentation, manuscripts and photos: Things that reside in filing cabinets and drawers. Flat wares are what archives, collections and museums prefer, yet it’s important to realise that they never tell the whole story of a musician’s life. For example: nothing tells us more about someone than their reading, and we can find out most about their reading by examining their library. The tragedy of collating music estates is the fact that archives and collections are normally only interested in the ‘flat ware’ – the three-dimenisional objects that tell us the story of who someone was are often sold off, passed on or shoved into the attic or basement until somebody decides what they want to do with them. Yet it’s often these objects that tell us most, merely by their existence vicariously filling in details that ‘flat’ documentation cannot cover. Sadly, these objects are normally the ones that were abandoned upon having to leave their homelands. The ones that were saved have to stand in for all the ones that were lost, abandoned or stolen. 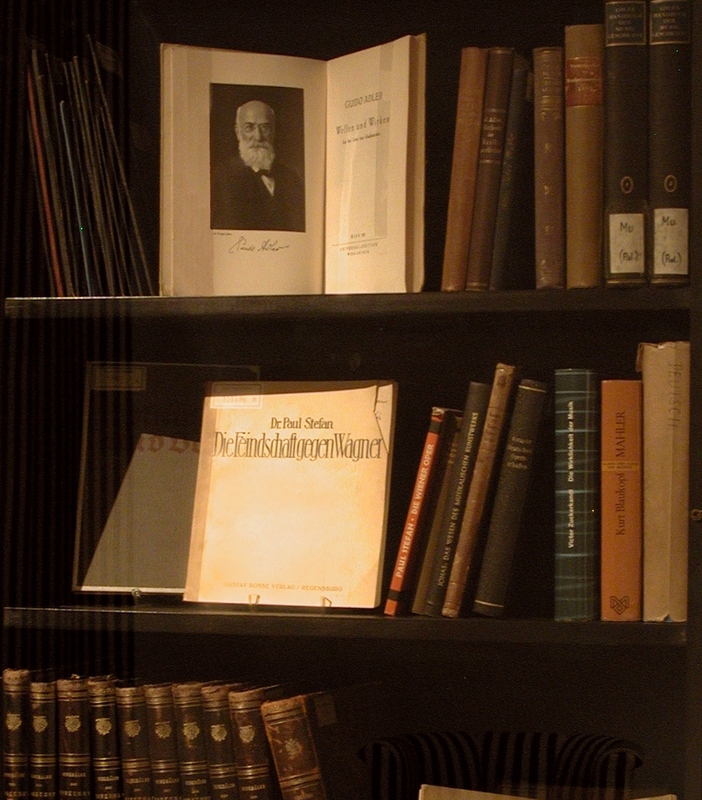 Unfortunately, libraries, archives and collections are unable to take personal libraries for the simple reason that they inevitably own many of the books already – of greater interest are the books with personal dedications which inform the researcher of the subject’s circle of friends. Another example of what Archives cannot take, but tells us a great deal, is the furniture and large possessions previously owned by an exile-musician. Families probably have no option but to pass such ungainly objects from generation to generation. 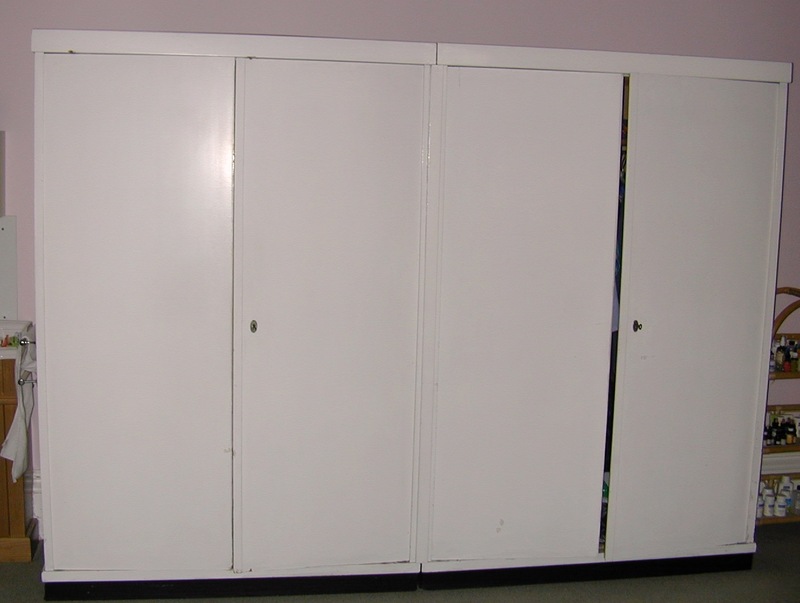 What is shown above is a large wardrobe that was designed by Josef Hoffmann, one of Vienna’s premiere designers and co-founder with Gustav Klimt of the Secessionist Movement. Such an object tells us a great deal about Gál (or as his daughter Eva pointed out, tells us more about his wife Hannah) prior to emigration: In any case, they were able to purchase items that were considered stylish, they were forward looking and they had the ready funds to pay for such expensive and unapologetically contemporary tastes. This wasn’t the same as purchasing something from the Ikea or even the Conran catalogue, as each piece was designed and handmade to order. 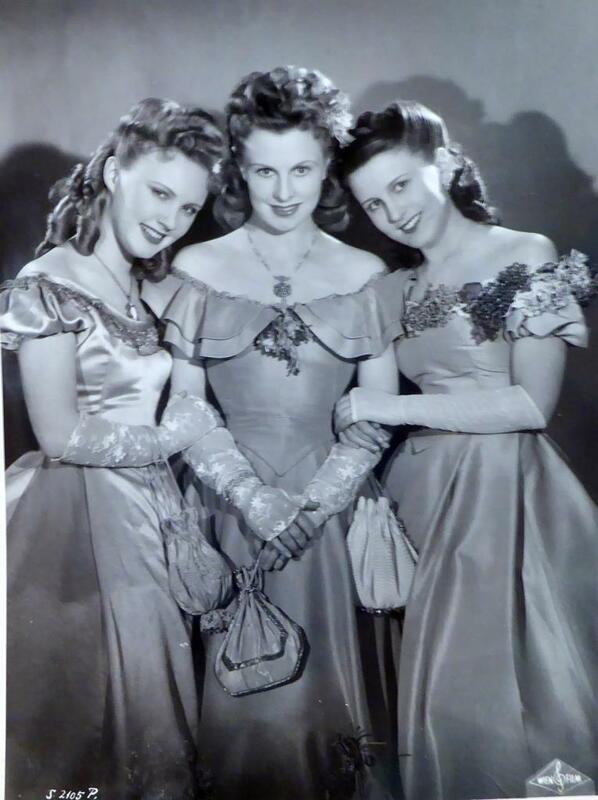 The Hilde Holger estate, held in a basement in London’s Camden town was a shock, when I went to see it, revealing the extraordinary significance of a Viennese dancer who had advanced modern dance along with such progressive colleagues such as Kurt Jooss, Mary Wigham and Rudolf von Laban. It’s not just the press clippings and the publicity photos that impress, it’s the remarkable portrait by Emil Orlik, or the exquisite costumes, sets and props all kept together that tell us the forgotten story of someone who had to reinvent themselves later. Likewise Hans Gál’s piano – a Blüthner – reminds us that the near monopoly of Steinway was a post-war phenomenon. Before Hitler, there was a plurality of pianos that graced homes and concert halls. This came to me when reading Ernst Krenek’s memoirs when he writes that the first thing he purchased upon making a huge amount of money following the success of Jonny spielt auf!, was a Schweighofer piano – Krenek goes on to write that they were generally considered the best pianos and were far and away the most expensive. Later when visiting the Austrian National Library’s collection of music instruments, I was struck by a Schweighofer piano owned by Franz Lehár – only later did I read that the piano manufacturers had been ‘Aryanised’ and after 1938, ceased to exist. 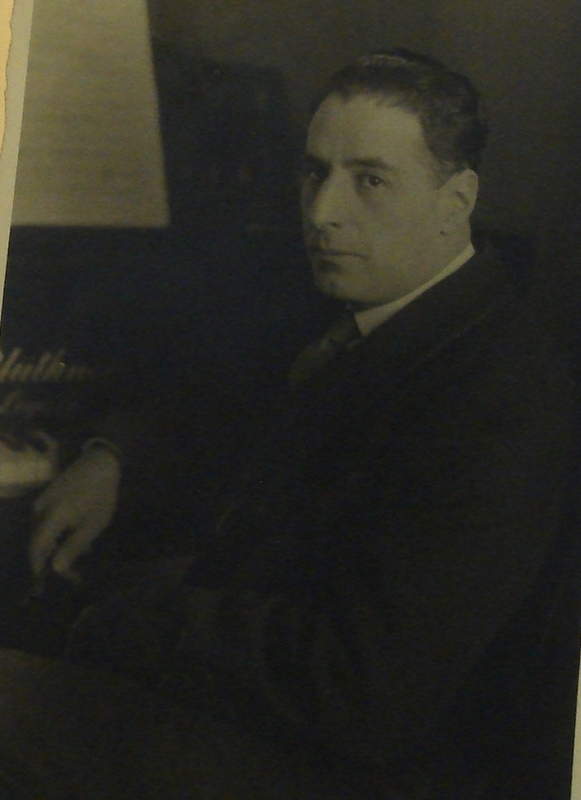 Likewise, the composer Ernst Toch was a high profile exclusive ‘Blüthner’ artists, photographed countless times as publicity for the manufacturers. By 1900, it was Germany’s largest piano maker and not only Ernst Toch and Hans Gál prized the instrument: other composers and pianists included Brahms, Tchaikovsky, Debussy and Rachmaninov. 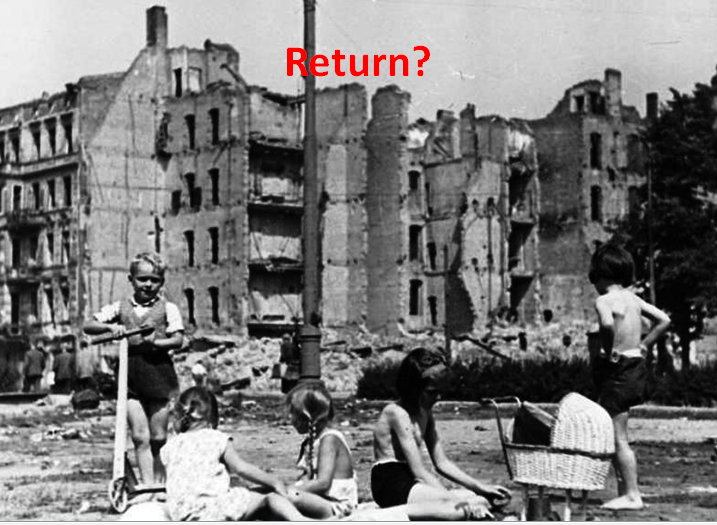 After the war, it fell into East German state ownership and lost much of its pre-war Reputation. These are the things, that apart from the flat-wares, tell us a great deal about a musician prior to exile – and sadly, most of it needs to remain with the family, as few archives will take on such items. Nevertheless, ‘flat ware’ documentation can tell us more than just how a composer or musician worked, but can also show us through imagery about the time in which they lived. 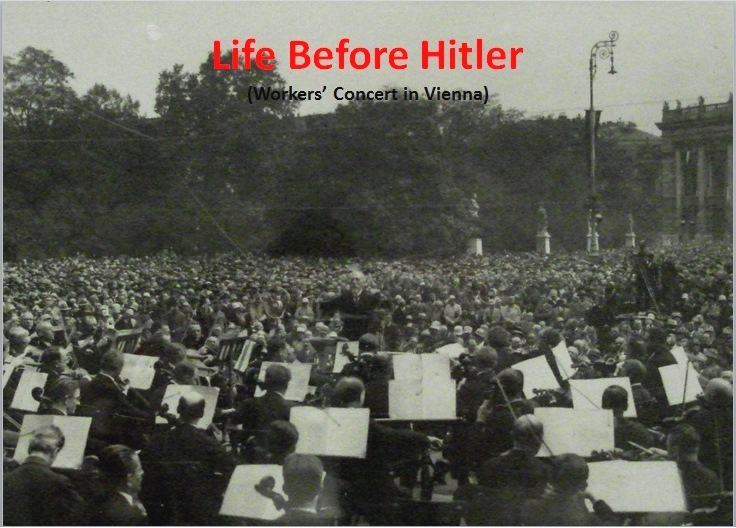 It’s one thing to read about the new-music festivals that dominated Interwar Germany, but understanding the spirit of these festivals often takes more than just sifting through programmes and press-clippings. Photos and/or personal correspondence tell us a lot. 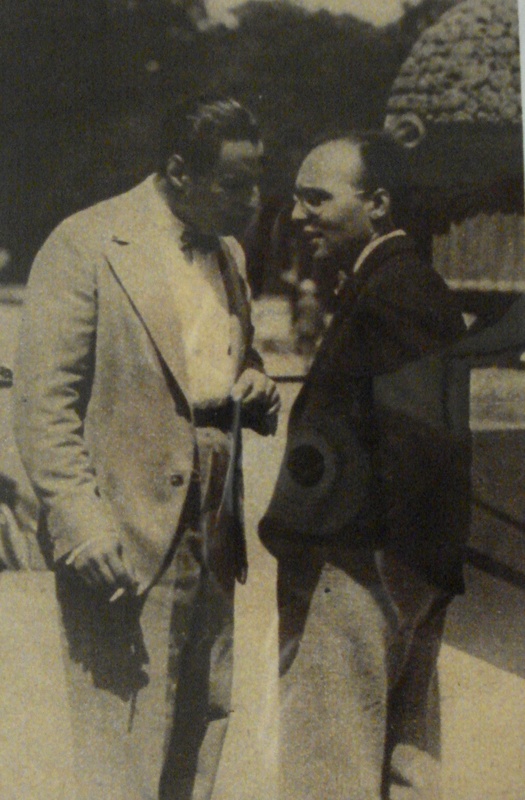 The photo of Toch with Weill – at an event where they both had one-act operas premiered, gives us a sense of the atmosphere: fun yet deadly serious at the same time. Likewise what is fascinating about the Hindemith postcard is the tone of his inquiry, which is not remotely ironic. It was as if this new age of moving Pictures, the most understandable thing, might have been doing away with musicians and having them replaced by machines. Another bit of correspondence – apparently on a non-descript piece of paper – is this short note that would ultimately have important consequences: Schoenberg’s letter of recommendation to his pupil Hanns Eisler to be passed on to Schoenberg’s publisher Universal Edition. Again, the message of the letter is revealing: ‘They almost didn’t take Webern until it was too late and they still haven’t made up their minds about Berg’. The letter is more than a letter of recommendation; it is a snapshot of where central pivots of music were at a particular point in time. 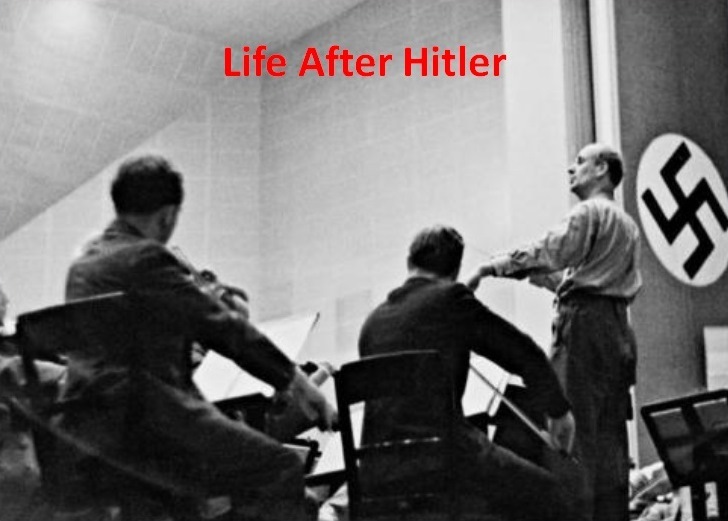 Life after Hitler has its own array of objects – including documentary ‘flat-ware’, but all telling more than just the story of how a work of Music came about. These are documents that fill in important visual blanks and offer deeper understanding of what happened to music during this period, which for most refugees, was of professional limbo. 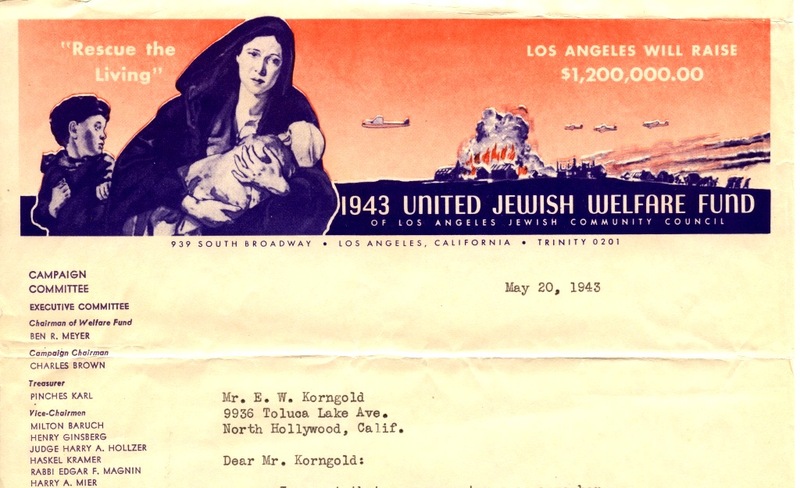 The above is one of just many letters found in the Korngold estate asking for help, though by 1943, little could be done beyond trying to resettle those who had already managed to escape. 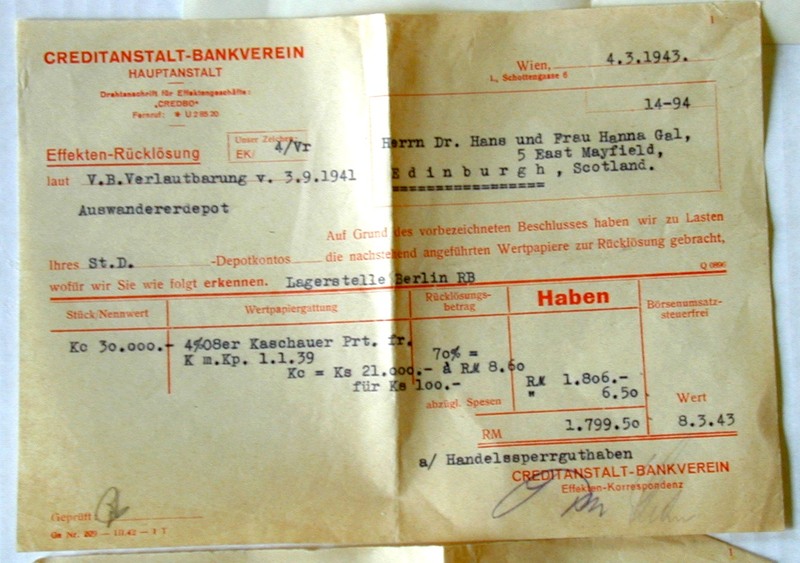 Other odd scraps of documentation raise more questions than answers such as this bank statement from Vienna to Hans Gál sent monthly from his Austrian bank – since 1938 a German bank – yet showing no sign of ‘Aryanisation’ or confiscation. Indeed, it records the interest and forwarded the statements to their client via an agent in Switzerland. We see the original amount in Crowns changed to Reich Marks along with deductions for the exchange. 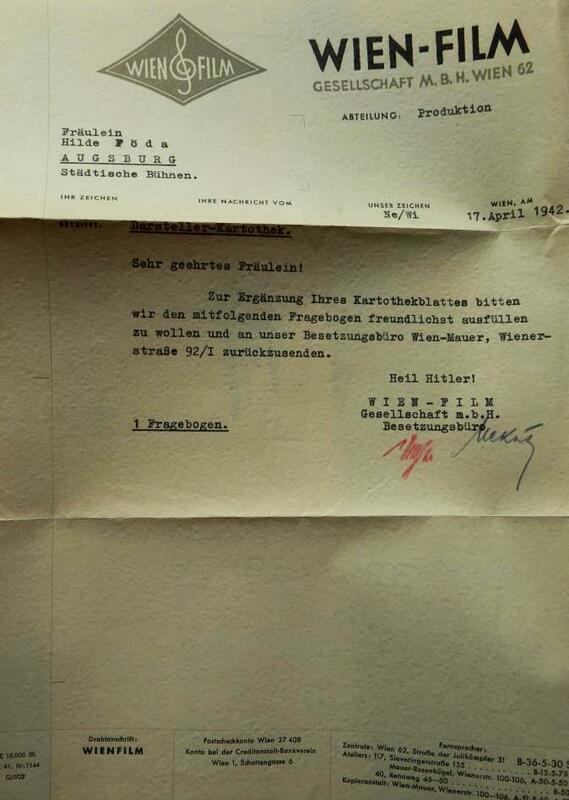 While Nazi V2 rockets tore into London, somewhere, somehow someone continued to maintain Hans Gál’s account in Nazi Germany either unaware that Gál was Jewish, or unwilling to allow his account to be pillaged. Either way, these bank-statements tell a tail that we may never succeed in understanding. It does confirm that there was no binary black and white, good and evil – it was far more complex and we may never understand the process behind these enigmatic bank-statements – they may merely remain the tip of a far more complex iceberg than we thought we had already come to understand. As we have covered this material in the past, I don’t wish to show the internment camp material as this has frequently been discussed and evaluated, most especially here at the Royal College where Robert Meyn has so spectacularly re-created Hans Gál’s Revue ‘What a Life!’ What I have found to be interesting was refugee musical life. 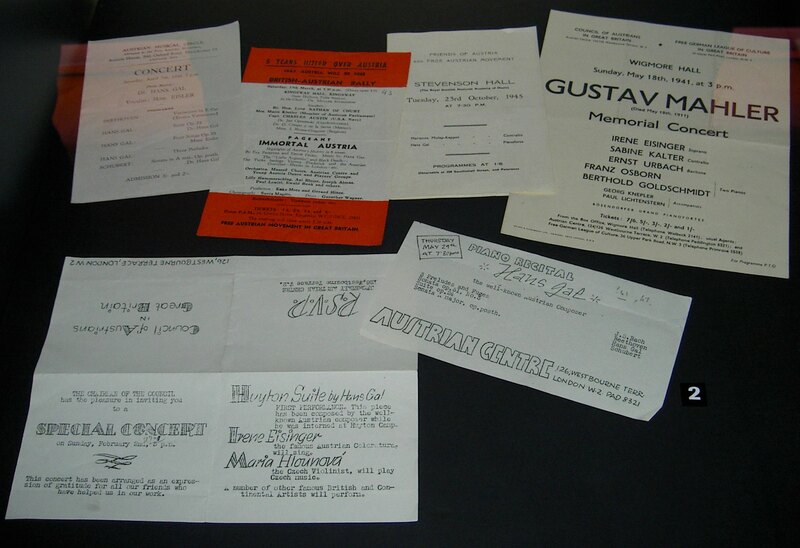 It was the product of Britain’s enormous wealth of German, Austrian and Czech musicians all of whom contributed to concerts that for a good deal of time were only limited to fellow refugees until popular demand allowed Londoners to attend these events as well. The Mahler arrangements for four hands by Hans Gál and performed by Berthold Goldschmidt and Franz Osborn are seen as the source of post-war British Mahler enthusiasm. Nothing adds immediacy to the situation than reading the letters petitioning for affidavits or funds for getting out of Nazi Germany, or once in safety, simply trying to find work. The shown extract is a heart breaking letter that goes on for a number of pages recording all of Korngold’s great successes in Vienna and expressing equal admiration for Korngold’s father Julius – only in the final paragraphs is the desperation clear. Whether Korngold could help is not known. 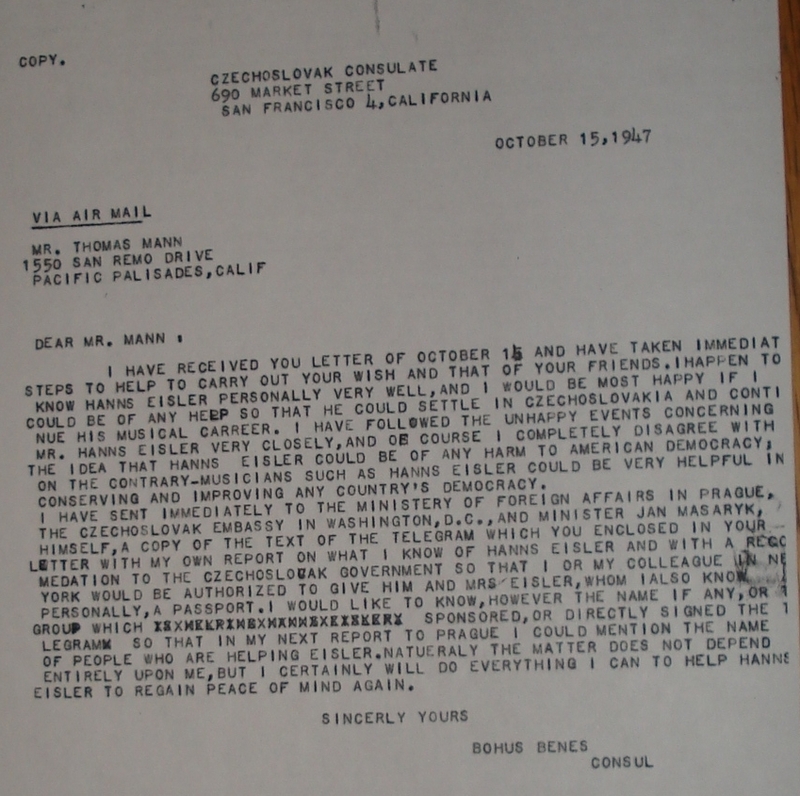 His wife writes that he helped so many that the American immigration agency told him to stop as they no longer believed he had the funding behind him to guarantee the affidavits he was signing.The letter above is from someone who can only hope Korngold recalls meeting. Nor can we know if he and his family were helped. 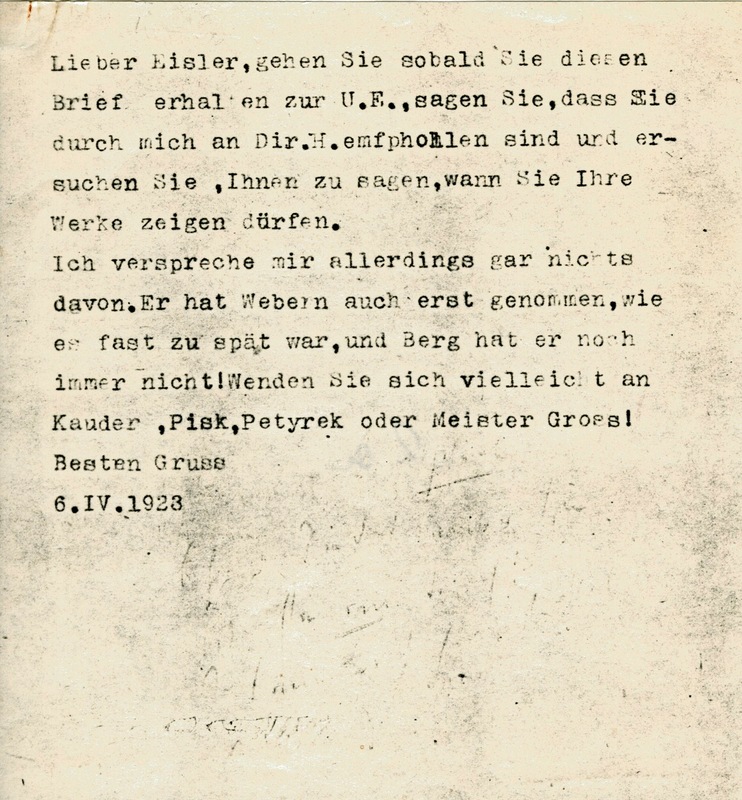 The above letter from Rudolf Kolisch – former leader of the Kolisch quartet is more revealing. 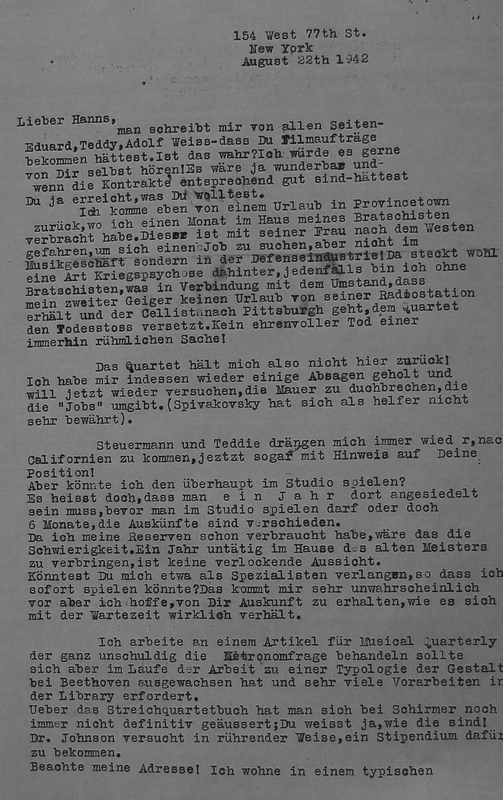 His sister was married to his former teacher Schoenberg, yet Kolisch pleads to fellow Schoenberg pupil Hanns Eisler to be spared from having to stay with his sister and brother-in-law when he comes to Los Angeles to look for work – again highlighting a dynamic that mere history books cannot easily convey. 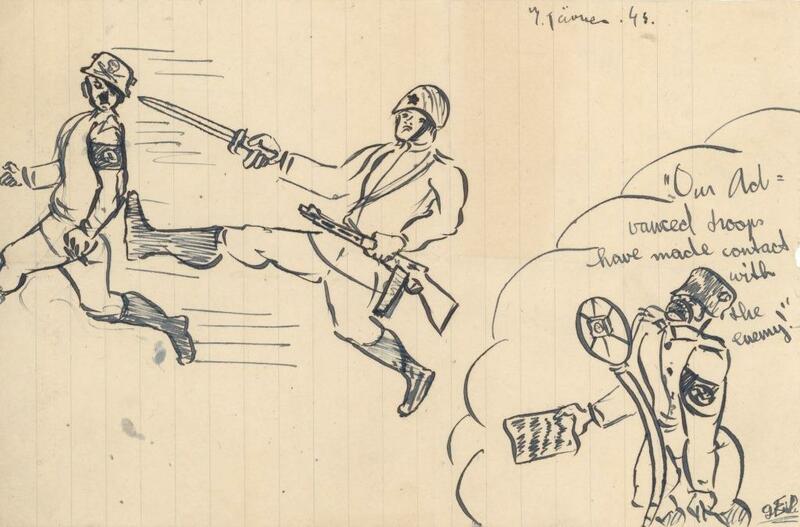 Learning a new language was also a challenge – again, documentation found in the Toch collection tells us what émigrés went through as they tried to shed their old skins and take on new ones, complete with a different language, culture and means of communication. 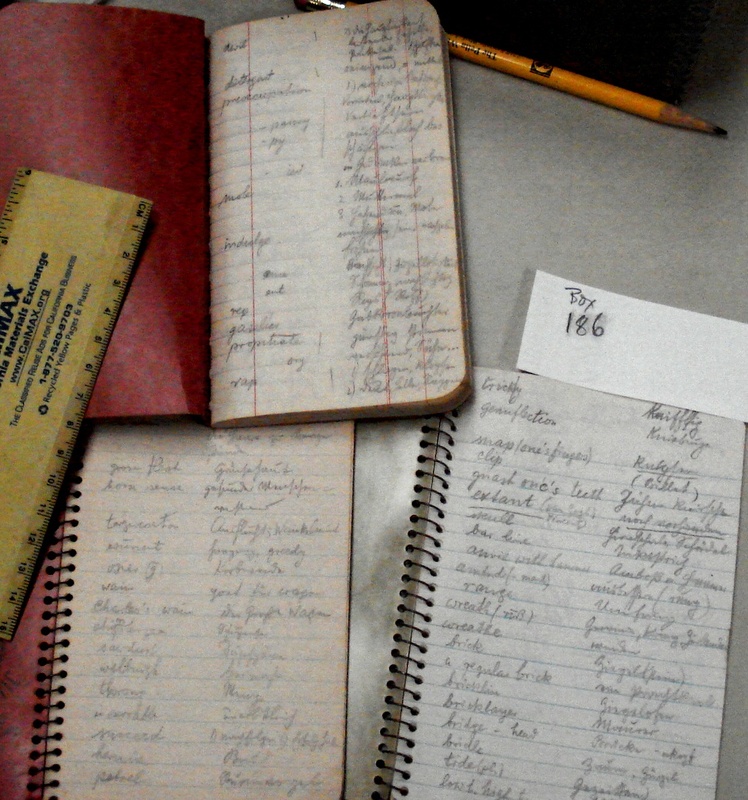 Ernst Krenek wrote his memoirs in English in order to learn the language, whereas Ernst Toch was more methodical and filled notebooks with German and English synonyms. He simply could not bear the thought of not being as articulate in English was he was in German. While Hanns Eisler was going back and forth between America and Mexico due to visa problems, his son and ex-wife Charlotte were stuck in England. 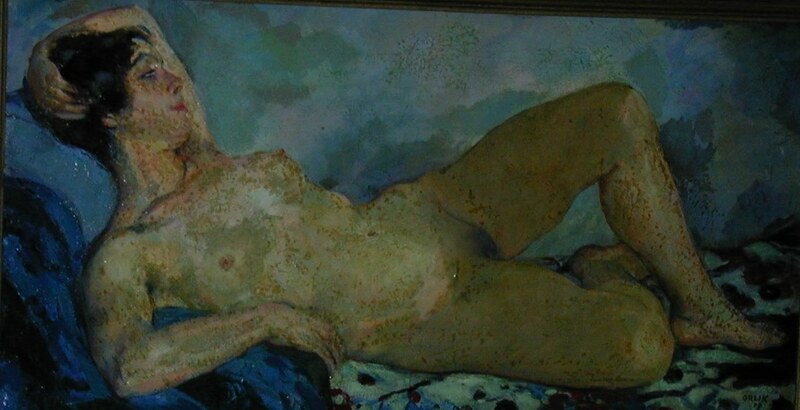 Eisler was unimpressed with his son’s artistic ambitions, despite the fact that Oskar Kokoschka had taken him on as a pupil – in fact, Georg Eisler would become Austria’s foremost post-war artist. Hanns Eisler’s letters during the war years to Georg are full of harsh admonitions, instructing him to study engineering or ‘something practical’. 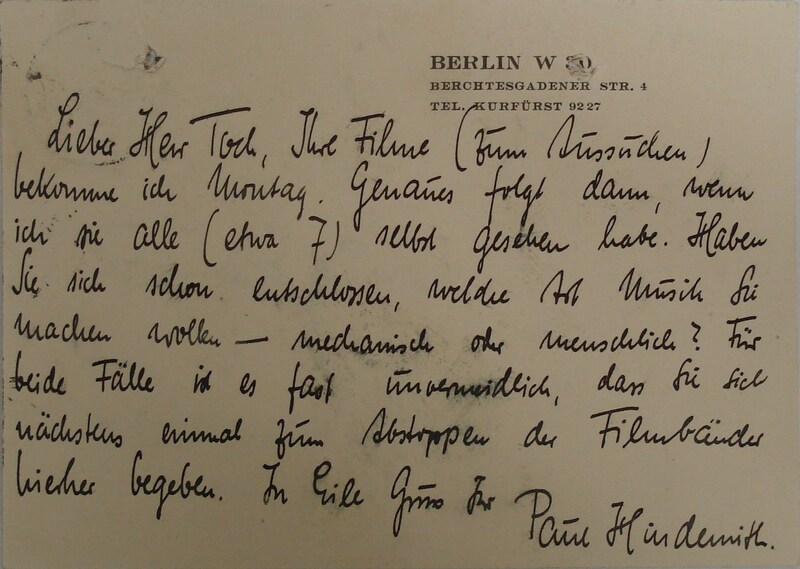 His letters from Georg continue to arrive stuffed with drawings. The Soviet routing of the Wehrmacht as imagined by a young boy in Manchester and sent to his Marxist father in Los Angeles, gives us a family dynamic between two enormously talented individuals as well as a snapshot of the emotions that were running in time and place. 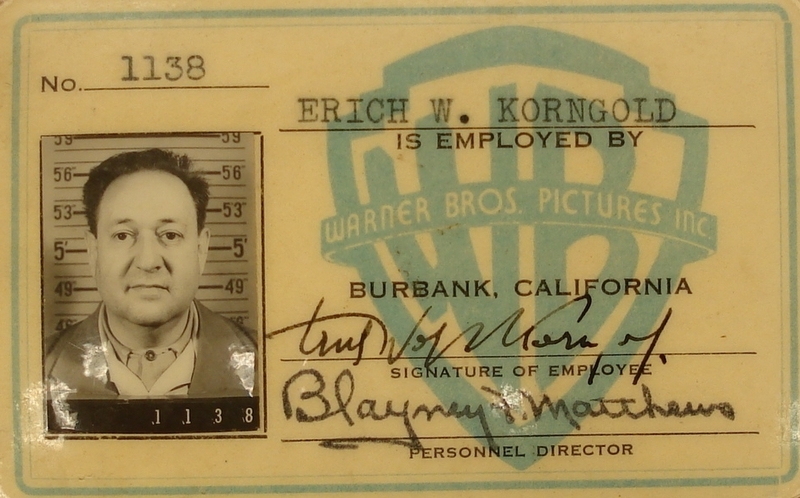 Korngold’s ID at Warner Bros. 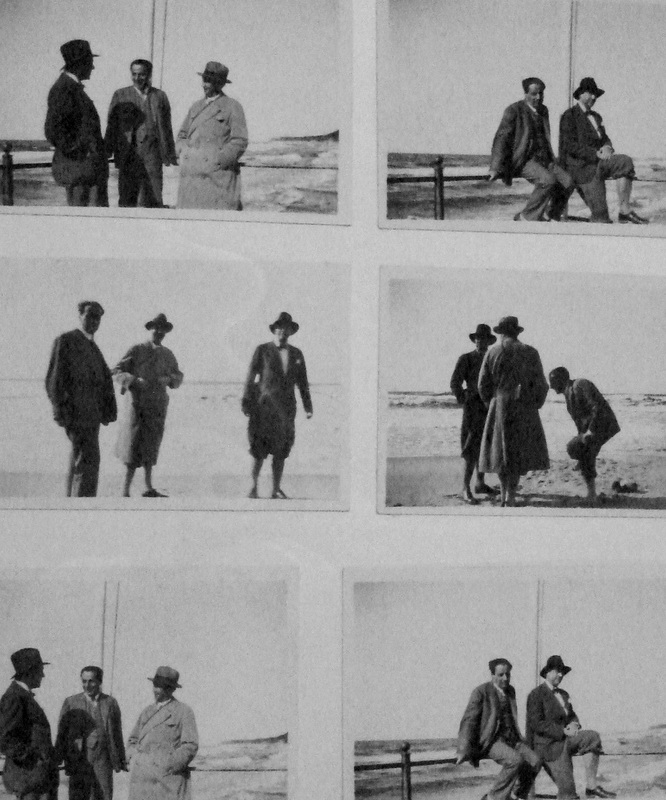 Along with Hanns Eisler working in Hollywood were countless others – Eisler was unique in seeing film scoring as an end in itself, the ultimate application of music and turning it into something practical and useful. Others such as Korngold, Ernst Toch, Erich Zeisl, Darius Milhaud, Franz Waxman saw movie music as a deflection from what they believed they were meant to be composing and left Hollywood’s studios as soon after the war as finances and circumstances allowed. Even if relatively well known individuals from Germany and Austria managed to find employment, others simply could not manage to exist at all without the help of fellow refugees. 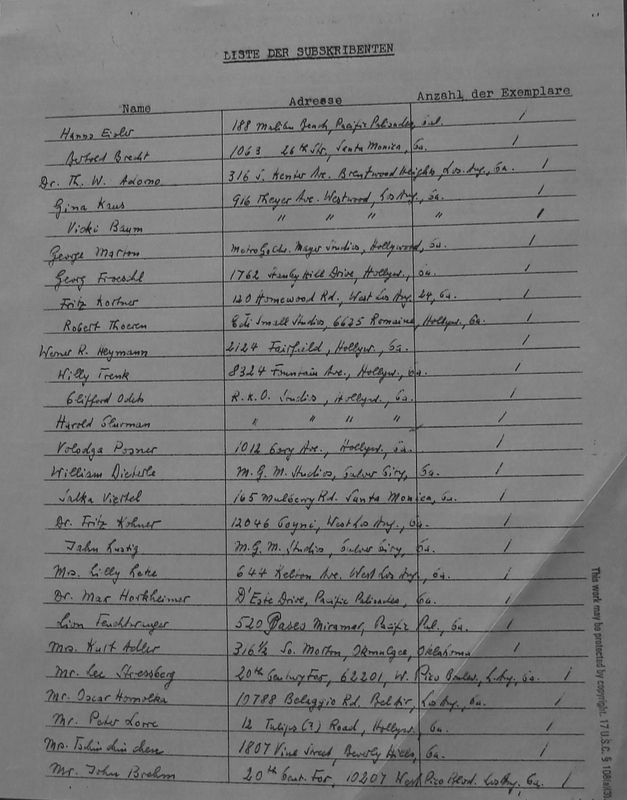 The list compiled of donors towards the support of Robert Gilbert – also known as David Weber and born as David Winterfeld, is a nomenclature of Europeans exiled in America – this is a mere extract of one of its 3 pages. Gilbert, under the name of David Weber, had not only written the texts to some of the Weimar Republic’s most iconic fight songs, he had written Songs (and/or texts) that every Berliner knew, such as Das ist die Liebe der Matrosen; Durch Berlin fließt noch immer die Spree; Das gibt’s nur einmal, das kommt nicht wieder; composed songs and texts for Beatzky’s White Horse Inn, (Was kann der Sigismund dafür, daß er so schön ist? )and collaborated with Werner Richard Heymann on his best known films in Berlin. In America he was destitute and at the mercy of fellow émigrés who had managed to gain a toehold somewhere. The list is not just a representation of who helped Gilbert, it’s a list of who’s who in war-time American exile. 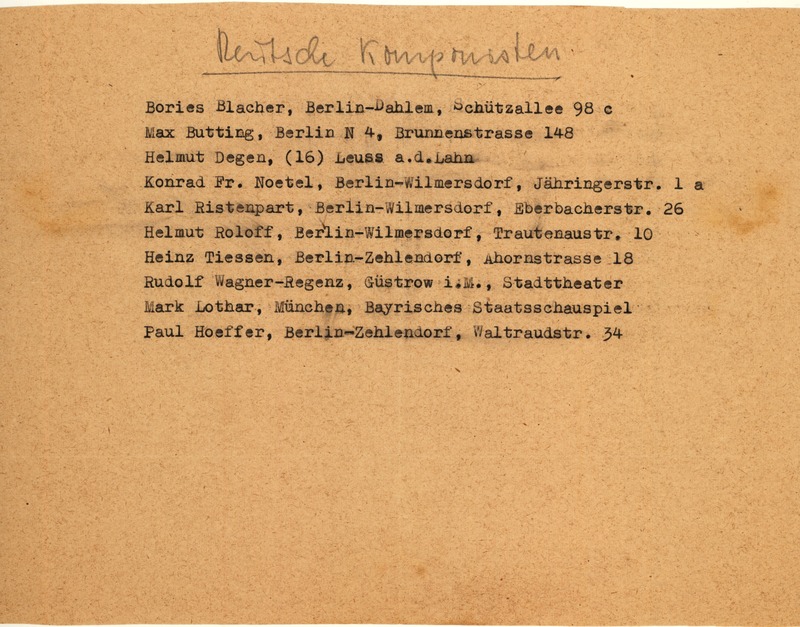 The first name on the list is Hanns Eisler, followed by Bertolt Brecht, hardly better off financially than Gilbert himself. Other familiar names were Vicki Baum, Salka Viertel, Peter Lorre, Theodor Adorno, Kurt Adler, Lion Feuchtwanger, Max Horkheimer – there follow another couple of pages. We can’t imagine what it must have been like trying to get by in a new homeland while still remaining emotionally and culturally tied to native countries. After the war, the first thing that people clearly tried to do was to re-establish contact with former friends and colleagues. 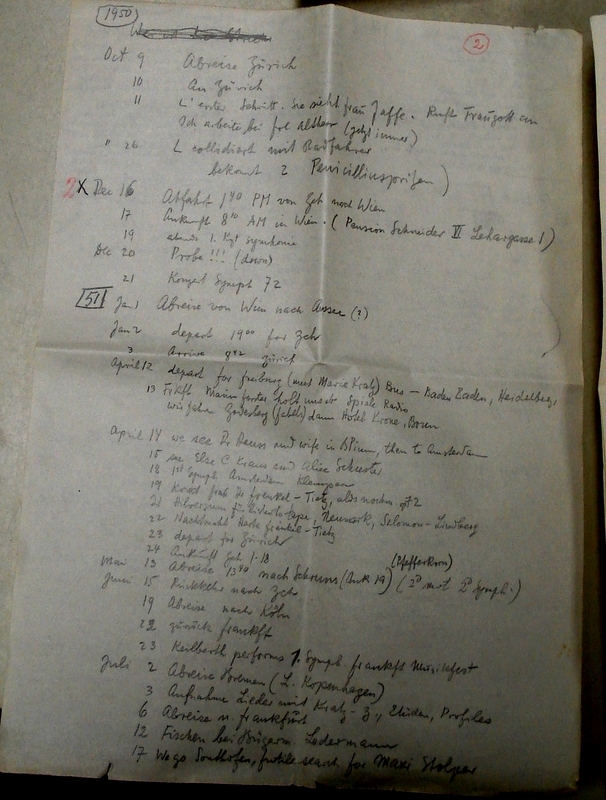 Few estates offer as much documentation underling the ambiguity and frustrations of establishing a new life as Hanns Eisler’s – denounced by his own sister after the war as a communist agent, he was forcibly deported, arriving in Austria where his black listing by Americans meant he could only work in the Soviet sector of the city. 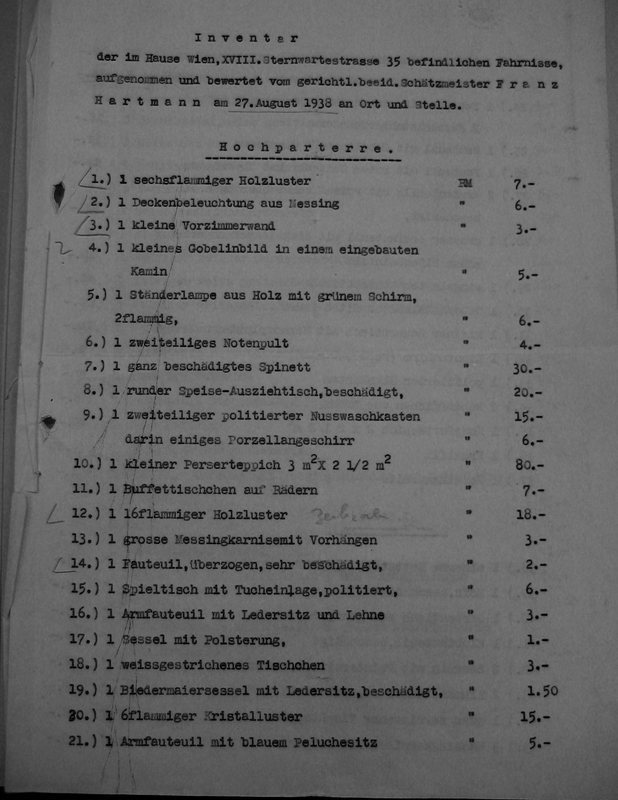 His deportation had further repercussions that are too little acknowledged but come to light when checking documentation, such as Thomas Mann’s attempts to procure Czech citizenship for Eisler. 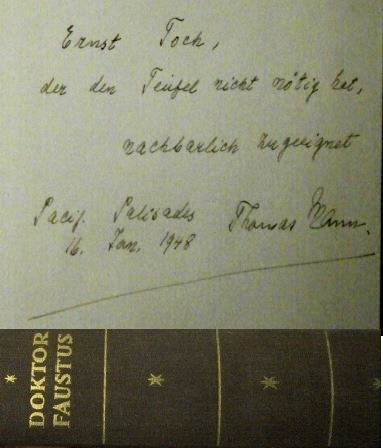 Thomas Mann soon followed Eisler’s return to Europe and documentation in the Eisler archive indicates the extent to which Mann felt ill at ease in post-war America. Eisler’s deportation from America as ‘Un-American’ had a tremendous effect on former refugees who recalled Nazis referring to them as ‘Un-German’. Benes himself would add the final paradoxical irony by being in charge of Czechoslovakia as all German speakers were first interned as traitors, then ruthlessly marched out of the country. 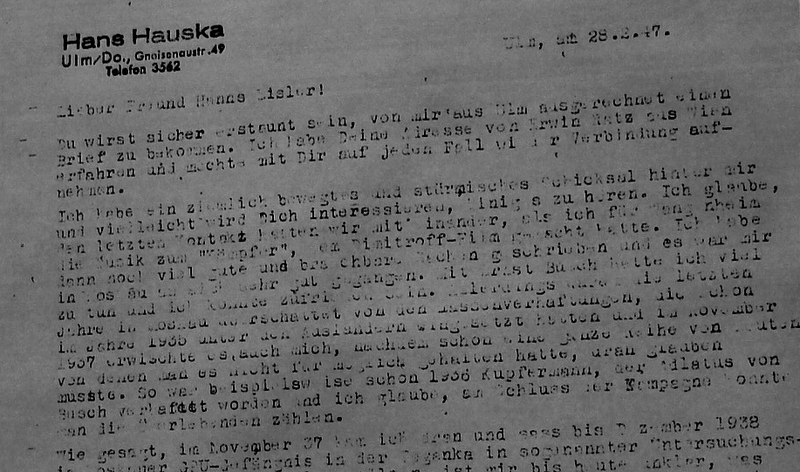 Yet another document that asks more questions than it answers, is a lengthy letter from Eisler’s former pupil Hans Hauska from February 1947, in other words, before Eisler’s deportation in 1948. What is chilling is Hauska’s account of former colleagues, friends and pupils of Eisler who have fallen victim to Stalin’s purges. Eisler’s former lover, Heidi Gutmann, would suddenly reappear on his doorstep after Brecht had negotiated her release from a Siberian Gulag in the mid-1950s. The fate of many others in Hauska’s letter is only too clear. It means that Eisler – who never uttered a word of public criticism of Stalin or the System that dominated the Soviet Bloc – knew very well what kind of life he would be entering by becoming part of East Germany’s cultural establishment – a position he could hardly avoid after composing the national anthem for the Soviet Sector of occupied Germany, now re-configured into a buffer state within the Eastern bloc. 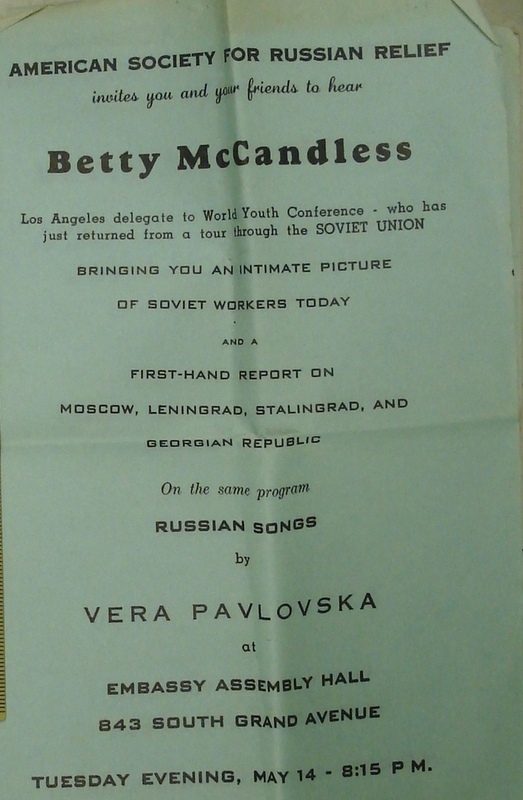 But Eisler’s avowed and open Marxism was not inconsistent with America’s view of the Soviets as allies before the end of the war – such concert brochures and flyers for similar events can be found in nearly all American musical estates regardless of their political leanings – perhaps a fact too easily forgotten during the cold war. Could there be any return to former homelands? Some managed, but most didn’t. Very few prominent musicians chose to return, with the most prominent being those who eventually lived in the German Democratic Republic such as Paul Dessau, Hanns Eisler, Ernst Hermann Meyer or Georg Knepler. 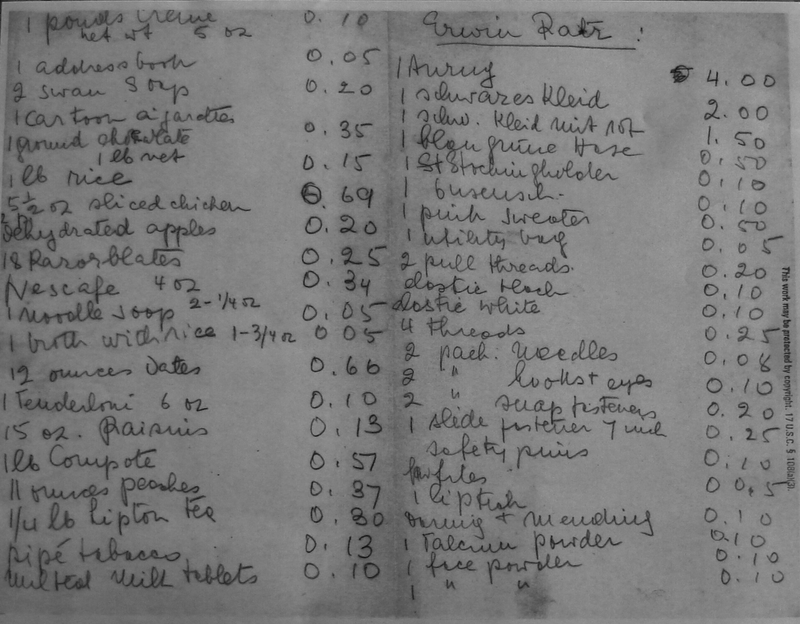 The ones on the list above belonged in large part of what we would call the ‘grey zone’ of Nazi guilt: they certainly had little sympathy with Hitler and his policies but unable to emigrate, found themselves having to come to accommodations. As the musicologist Alfred Einstein wrote to Hans Gál, ‘how could I possibly offer my hand to any of my former colleagues wondering what they had done during those years?’ The ones on the list above survived as best they could, while keeping their heads low. Was there some sort of coming to terms? Perhaps – one of the things that surprised me was the vague acknowledgement accorded to Jewishness – something nearly all émigrés had renounced. 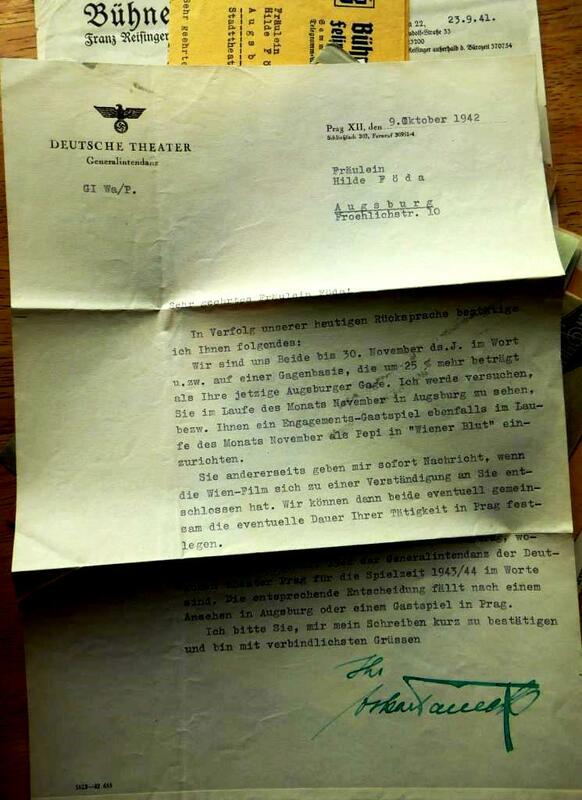 Even Hanns Eisler’s estate held correspondence from the East German Synagogue. It was after all, as many pointed out, Hitler who made them Jewish. Yet as they grew older, there also grew an awareness of who they were and perhaps why they could never return. Ernst Toch’s Dream diary, seen below, was another surprise – something that added meat to the bones of historic facts. What went through these people’s minds? What were they going through? 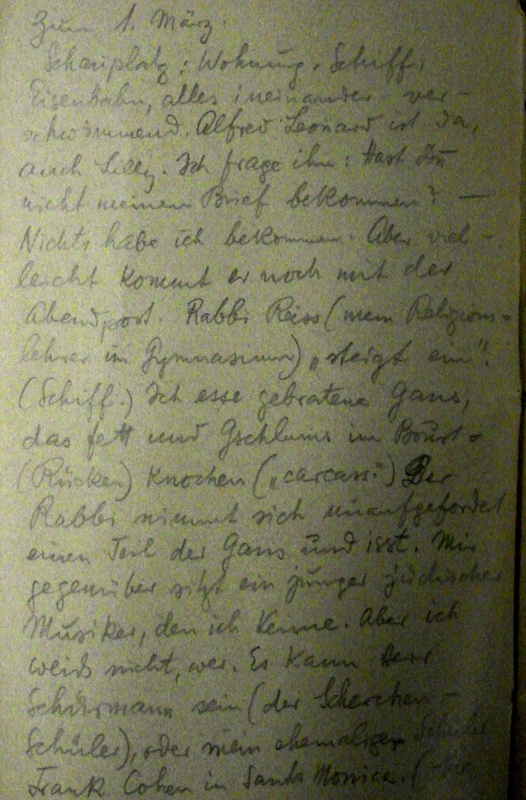 The diary hints at much of this information and it is fascinating to see how many utterly secular – indeed openly atheistic composers were prepared to compose works with Jewish subjects – some were vaguely liturgical, others less so – but all acknowledged the sobering fact that just by being Jewish, they could no longer feel at home in their native countries and needed to come to terms with their countries of refuge. The Dream diary is full of insecurities as expressed in dreamt meetings with his Viennese Rabbi or family members left in Vienna he dreams meeting in Los Angeles. Toch is noticeably stressed at having to explain how different America is to Austria. So is this how we leave things? No – the tragedy is that archives and collections can never take the things that tell the full story of a musician and the experience of exile: they can’t take the large objects, the libraries, the ephemera and these things remain in possession of the families. Perhaps this is a good thing. Families will always have what the rest of the world cannot possess – those intimate objects that made the musician a person with feelings and needs. These are things though that help us understand the creative process and though archives and collections may not be able to take on such unwieldy objects, it would be a mistake for the researcher to ignore them as he or she try and understand the pieces of a jigsaw. 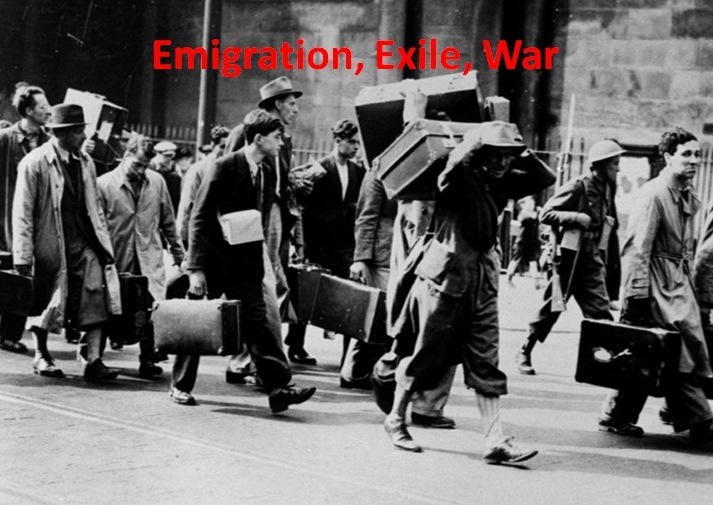 But ‘exile’ has two sides: there were those forced from their homelands and there were those who stayed and filled the gaps. Let’s leave the question of whether individual careers would have been as successful if the number fleeing Nazi persecution was not enormous. One of the other ‘victims’ of the Nazi years, was our understanding of how things carried on without the participation of some of the truly great names who fled. After 1945, individuals and institutions divested themselves of Nazi associations meaning that today, it’s very difficult to understand how, in the face of such an exodus, opera houses and orchestras even carried on. The photo above is of the popular dancer, photo model and soubrette Hilde Föda, who until 1938 was the fiancée of the son of Karl Buresch, a minister in the Austro-Fascist regime. As the son of such an important individual in the anti-Nazi ‘Fatherland Front’, he had no option but to leave or be picked up by the Gestapo. His extremely beautiful fiancée remained and made a more than respectable career. 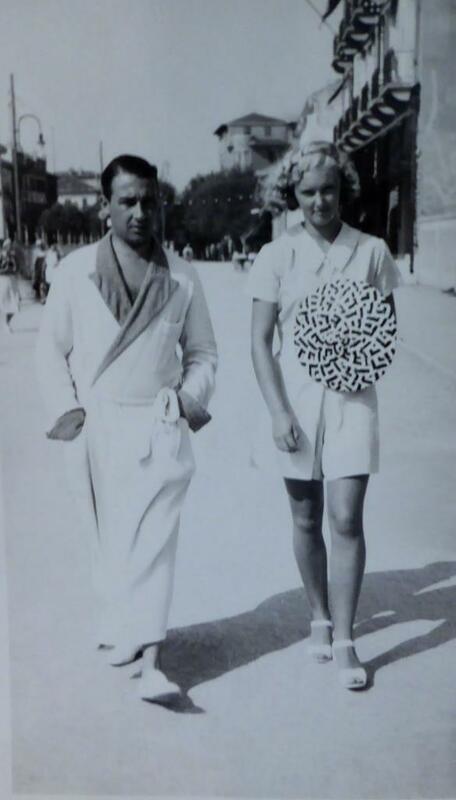 In 1945, she managed to get herself a position in Zurich, appears never to have been sufficiently reflective about politics to have joined the Nazi party and was seemingly attractive and talented enough not to need to. She married an American Army officer, moved to California and took her boxes of business and private documentation with her. She never threw anything away. Her papers include everything from memos informing her of rehearsal times and locations, to admonitions about the correct means of obtaining a release from a theatre where she is regularly engaged, to shoot a film. Such day-to-day documentation is hard to find beyond the individual estates of those who were there. After the war, most celebrities felt themselves compromised and got rid of such mementos out of fear of potential professional harm . 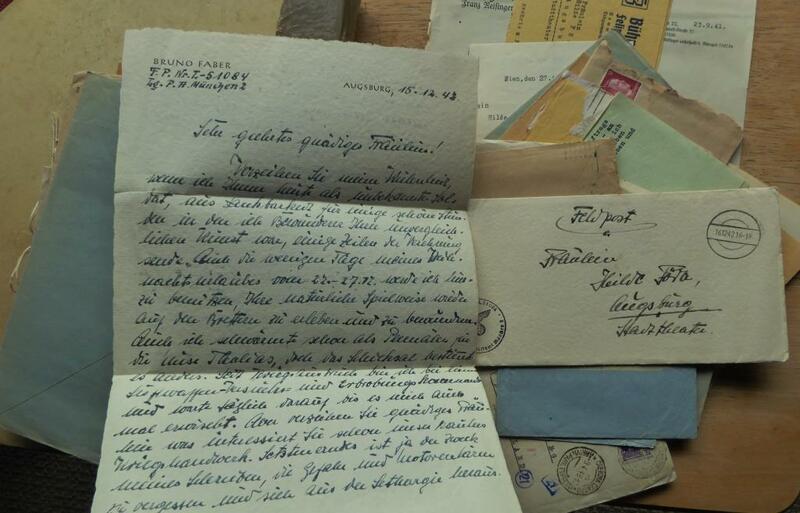 The other surprise was a large box of letters from the Front, where she had performed for the Wehrmacht, the soldiers conscripted to carry out the dirty business of the III Reich. There can only be very few such collections that have survived, and nobody can fail to be moved reading the letters of simple boys, brain-washed in order to carry out a deadly war far from home. 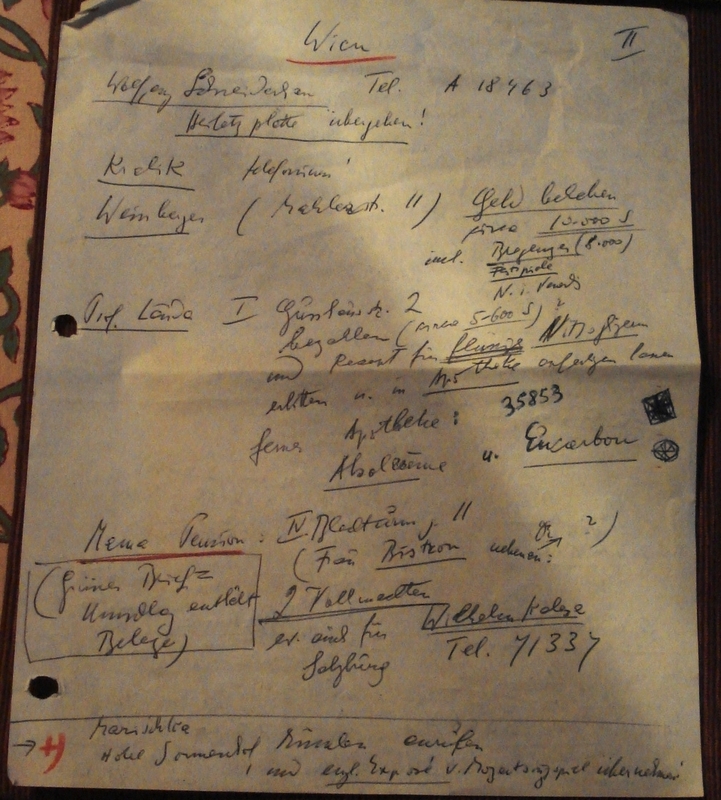 Selection of Hilde Föda business correspondence from the Nazi years. Such things often remain in private hands, so families and heirs will continue to have a role to play – but there are dangers as well. Letting go can never be easy. It takes brave families on both sides to recognise the greater good of passing on documentation to the future for preservation and in the service of scholarship and understanding. The murderous mid-20th century was too bloody for reconciliation, but understanding the human elements on both sides is also important. The boxes of once prized possessions of a once prominent musician, composer or singer hold more than memorabilia, they hold the key to understanding. Thank you for this excellent and comprehensive account. The more I read, the more I realise the need for a dedicated museum for this vast subject. Indeed it occurs to me that no one existing institution currently has the resources for the materials scattered around the world, many of which still await a safe and permanent home. Regarding the problems concerning large objects (such as pianos), I would add that leaving them where they are is not always the best solution. 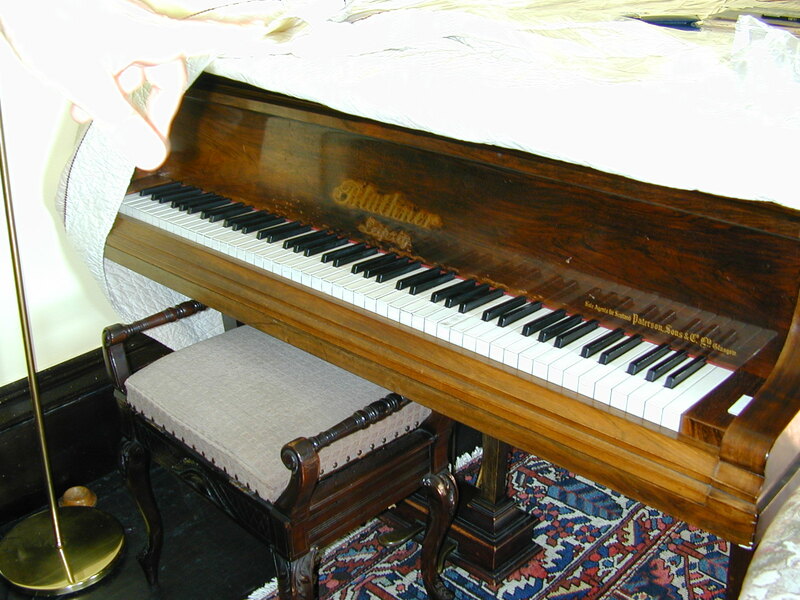 Vilem Tausky’s piano (itself inherited from Eric Coates) was given to a school for “general use”. Korngold’s piano in Hollywood was regrettably sold when its owner, moved house! Its current whereabouts are unknown! I would include in your list of important ephemera the tremendous value of private home recordings and home movies. As you know, Korngold’s estate was especially rich in materials of this kind. Thankyou for continuing this important debate. Thank you for your comments. In fact, in the original lecture, I showed a photo of Korngold’s private recordings. I did not include it on this modified version of the lecture as the subject of Hilde Föda came up in subsequent discussions it was clear to me that she – and others like her – was of equal importance. I am in awe — simply, in awe — at what you’ve written here! I will have many, many hours where my mind will be in overdrive trying to digest all of this. It is simply stupendous! My only regret that I was not in attendance at your original lecture!. Please Joseph! Do NOT be in awe! I’m just very glad that you find it interesting. Please click on the documents to read, and if you need the entire text to any of the letters, I’m happy to Forward it. If it all possible, please forward all the documents referencing Korngold, as well as the Toch’s lists of German/English synonyms, and the subscription list for Robert Gilbert. As an aside, I appreciated your digression about Bluethner pianos as I have been doing a bit of reading online lately about German and Austrian pianos, especially about the Bluethners. With the demise of East Germany, I am wondering how much Bluethner has regained of their former reputation — and market share, too — and perhaps you can supply some further insights on that subject. As it turns out, about 3 years ago while hunting for a Christmas present for my girlfriend, I stumbled across a showroom here in the Dallas area that carried Bluethner pianos and — boy — they weren’t cheap as a grand (perhaps a concert grand?) was going for $135,000 and they were proudly advertised as the piano that Franz Liszt played. That’s a lot of money for someone like me who can only play “Chopsticks” . .
And let me repeat my sentiments stated earlier but in a slightly different way: This is wonderful — ESSENTIAL — work you have done here and in Forbidden Music.